Who isn't familiar with the luxurious shopping arcades of the Königsallee (King’s Avenue), also known as the "Kö", which fills shoppers with anticipation and delight? Drive down one of the world’s most beautiful boulevards in one of our elegant, chauffeured limousines. Your driver will be happy to wait for you, eliminating the stress of having to find parking. Düsseldorf, the state capital of North Rhine-Westphalia and a Carnival and shopping metropolis, is also host to many international fairs and events. Upon request, our chauffeur service can meet you when you arrive at Düsseldorf airport, take you comfortably and safely to your business meetings and events in the city and take you back to the airport on time for departure. Care to do some quick shopping at the Kö, eat in the old town, visit Benrath Castle or enjoy a breathtaking view of the city? Contact us for our hourly rates. 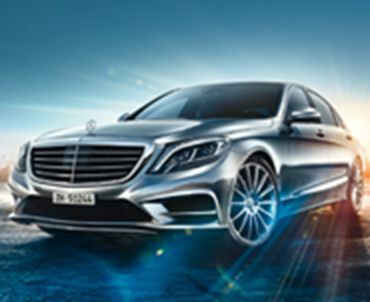 Our chauffeur service, together with our fleet of exclusive business and first-class models, are at your disposal. Book your transfer with us. Rely on us to take you from the airport to your hotel, from the hotel to your event and back to the airport, safely and on time. For an hourly hire fee, our chauffeur will remain at your disposal. This service is particularly handy if you want to go for a shopping spree or on a city tour in between business meetings. Select one of our spacious and comfortable minivans and/or buses for group trips. We’re always there for you. Book our entire range of services quickly and efficiently by phone or email. Just give us the number of passengers, preferred vehicle model, the destination and pickup locations and you'll get an immediate quote. Convenient payment by credit card, bank transfer or invoice available. Need a limousine for a longer trip from A to B or like to hire us by the hour for round trips or group excursions? Our experienced, friendly service team will be happy to help. TOP-ALLIANCE – We’ll take you through the city. Services in the listed cities are provided by TOP-ALLIANCE and/or our partner.